Baby Shower Flowers A birth is an exceptionally joyous occasion, as is the lead up to the birth. A baby shower is a time to pamper the soon to be mother with an exquisite decoration of baby shower flowers. What a way to light up the occasion with a magnificent baby shower flower bouquet. 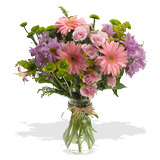 All our flowers are hand picked and all arrangements are hand tied with the utmost attention to detail. Baby flowers add splendor to the occasion.